Hyperacidity, also known as acid dyspepsia simply means increase of acidity in the stomach. The human stomach contains gastric glands that secrets hydrochloric acid which is necessary for the digestion of foods. When the stomach contains an excessive amount of hydrochloric acid, then the condition is called as hyperacidity or acid dyspepsia. The level of acids in the human stomach is generally controlled; but for some reason the level of acids increases beyond the normal levels and results hyperacidity. The stomach is equipped with these acids in order to be able to digest the food. The acids are released when foods enter the stomach. However some foods are difficult to digest than the others. For such foods, the stomach needs to secrete more acids. Continuous secretions of such acids could lead to hyperacidity in the stomach.This excessive production of acids could be made higher due to various factors. Ulcers in the stomach are one of the commonest causes in increasing acid production. GERD (Gastro Esophageal Reflux Disorder) is a chronic disease that is characterized by the reflux of gastric contents into the esophagus. Hypercalcemia -Hypercalcemia is the increase of calcium level of the body that can also lead to hyperacidity. It can be caused by various medical conditions such as parathyroid problems, malignant tumors, vitamin D metabolic disorders, and renal failure. The digestive system is at the very core of our well-being. Every part of the body is affected by what we eat and how the digestive system absorbs the nutrients from our foods. Thousands and thousands of hyperacidity patients are taking regularly some sort of acid blocking drugs or antacids that suppress symptoms but do nothing to treat the underlying causes of diseases. For most this is becoming a lifelong habit with high cost, not only in monetary terms, but also through the long list of side effects and gradually declining overall health. In this regards a proper homeopathy treatment targets to treat the cause of hyperacidity and as well as improves the acidity symptoms very effectively and rapidly than other therapy. The indicated homeopathy medicines can be of great help not only in improving the hyperacidity symptoms but also to cure the disease completely if avoids the trigger factors of hyperacidity with the homeopathy treatment. Homeopathy treats the person as a whole. It means that homeopathic treatment focuses on the patient as a person, as well as his pathological condition. The homeopathic medicines are selected after a full individualizing examination and case-analysis, which includes the medical history of the patient, physical and mental constitution etc.A miasmatic tendency (predisposition/ susceptibility) is also often taken into account for the treatment of any chronic conditions. So in severe acidity case homeopathy treatment not only improves the acidity symptoms but also help in proper digestion, absorption, normal bowel motion and overall health improvement. The patients who have the tendency of excessive gas formation and gurgling of bowel sound can be very well cured with a proper homeopathy treatment. Patients suffering of irregular bowel movement and constipation due to irregular peristaltic movement can be cured completely with proper homeopathy treatment which helps to settle up the normal peristaltic motion. Symptoms of burning chest, belching, sour taste in mouth are the outward reflected symptoms of hyperacidity. 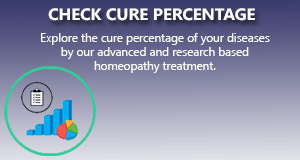 With a proper homeopathic treatment those symptoms can be cured. The mental stress, worried, anxiety, depression are the psychological stressors of hyperacidity. Homeopathy treatment is based upon the total symptoms of the person not only from the disease related part but from the other aspect like mental, physical and spiritual aspects thus helps to treat the cause of the disease whether origin from psychological source or physical source or deep seated emotional source. Thus help to cure the disease at its deep seated root level. The hyperacidity caused by any psychological stressor can thus be cured by proper homeopathy treatment as it treat the underlying cause of the health problem. The duration of treatment: The minimum time period of getting any remarkable result can vary from 1 week to 3 week. But the total duration of treatment depends from person to person as per their chronic nature of the disease and their constitution. Eat smart! Eat moderately. It is better to take a small frequently meal than to take a large meal. Go to bed minimum 1 hour after taking dinner. Walk a round after dinner is better for your health. Avoid taking more tea and coffee. 1.NUX VOM:- Is an excellent remedy for gastric derangements. There is loss of appetite, pain after eating .Indigestion is the ranking symptom of this remedy. It has pains radiating to various directions from the epigastrium with spasmodic vomiting. Nervous gastralgia. The discomfort comes about half an hour after meals. When due to spirituous liquors. 2.CARBO VEG:- Slow and imperfect digestion, weight in the stomach and intestines and a faint and all-gone sensation in the stomach not relieved by eating. But after a few mouthfuls there is a sense of repletion. There is violent burning in the stomach, chest and abdomen with crampy pains which force the patient to bend double. Heaviness in the stomach. The eructations are rancid. Sour and putrid. There is flatulence in stomach or upper part of the abdomen. 3.CHINA:- Where there is flatulence in the whole of abdomen and the distension is painful, Only relived momentarily by belching. Sour or bitter eructations or offensive flatus. Digestion in slow, worse after late supper. Yellow diarrhoea, worse at night and after meals is an important keynote of this remedy. The absence of rancid belching with burning in this remedy distinguiShes it from Carbo veg. Another important indication of this remedy is that the food does not digest but lies. a long time in the stomach causing eructations and finally is vomited undigested. 4.LYCOPODIUM:- It is indicated when there is flatulence in the lower part of the abdomen. Vigorous appetite but few mouthfuls make him feel as if the stomach is bloated and he has to leave his meals. Unlike pulsatilla and Anacardium, the distress in lycopodium is seen Immediately after and not half an hour after eating as in the Former two remedies. Nux Mosch has distress immediately after eating but there is intolerance of pressure about the waist, not all the time as in Lachesis. Another important symptom of this remedy is desire for sweets. It is specially useful in the atonic and acid forms of dyspepsia, for it has sour taste, sour belching and vomiting, whenever it does occur, it is sour. Painful swelling at the pit of the stomach. Belching of gas does not afford any relief. Red sand in the urine. Colic in newly born children. 5.PULSATILLA:- Dryness of the mouth, putrid taste in the morning on waking and a sensation as if food had lodged under the sternum are characteristic symptoms of this remedy. Tongue coated with thick rough white fur: acidity and heartburn: food tastes bitter, sour or putrid: water brash and eructation tasting of food. No thirst, only a desire to moisten the mouth. Bad taste is special indication of Pulsatilla. It is specially useful for dyspepsia Arising from fatty foods, pork, pastry or mixed diets. The patient is chilly, But is worse from heat. Worse in the evening unlike Nux Vom, Which is worse in the morning. 6.PHOSPHORUS:- Regurgitation of food. Craving for cold food which is vomited as soon as it becomes hot in the stomach. Spitting of blood without nausea is also common in this remedy. Gone, weak feeling in the stomach, which, unlike Sulphur and sepia, extends to the bowels, burning between the scapulae is also present at times. Vomiting in chronic dyspepsia. It has special relation to destructive and disintegrating processes, hence it is one of the remedies for cancers, indurations, erosions, etc. A burning, gnawing, circumscribed pain is characteristic. Rapid loss of flesh and anaemia. I HAVE THYROID PROBLEM LAST EIGHT MONTHS WITH TAKEN ELTROXIN 25 DAILY BASIS .BUT CHEST PAIN AND ACIDITY ,GAS, CONSTIPATION INCREASING CONTINUE FROM LAST 4 MONTHS. okay its curable,So for any disease it is required for a detail consultation with the doctor. For treatment you can apply our online treatment or can come directly to our clinic. I have excess of gas in my stomach for last 3 years.i feel very uneasy. Loss of digestive. Drum sounds in upper stomach, most of time belching, not clear stool on morning. Suggest me the best medicine for this. Excessive gas in the middle of night. Pain in the chest and left shoulder, left back below shoulder. Patient has been operated for haitus hernia, female, 65yrs. Symptoms are relieved on standing and peak if lying flat or upright at 45°. Continuous belching for more than one hour. Symptoms appear between 1-2am daily, and usually last till early morning; sometimes 1 hour after lunch. Please help. Hi sir, Nice information. I'm suffering with heart burn since from 5 years. I used lot of medicines but those are temporarily relief. Is there any chance to cure my heart burn & acidity problem completely.. By homeopathy medicines. Naosea, vomiting & acidity with abdominal pain. please suggest best homeo remedy. High Gas & acidity . Having acidity problem since long ,taking Nexium 40, also on medicine for BP and BPH , suggest homeopathic medicine . Hyper Acidity I read thorough but I couldn't get 6 Best homeopathy Medicine kindly suggest the same thanks a lot. The names are mentioned in the article. Carbo veg 30 is the default go to medicine for me incase of acidity.